Three extraordinary voices, two founding singer-songwriters, one singular vision: The Wailin' Jennys continue to evolve into far more than the melodious sum of their individual talents five years after blowing in on a fresh acoustic breeze from Canada's mid-western heartland. The Jennys embarked on a giddy blur of activity following the release of their second album, Firecracker, in August, 2006. Numerous head-turning reviews ("quiet, warm, subtle, mellifluous … almost too good to be true," noted British daily The Independent) greeted a recording produced by David Travers-Smith (Jane Siberry, Harry Manx) and featuring a crew of ace musicians led by guitarist Kevin Breit (Norah Jones, k.d. lang). A progressively larger fan base thrilled to the trio’s intuitive harmonies and an uplifting set list laden with compassionate, life-affirming original songs. The tour schedule wound throughout North America, while also heading overseas to Australia, the U.K. and continental Europe. And foremost among an unfolding series of life moments have been a second Juno Award nomination in Canada, the continuation of a much-cherished relationship with A Prairie Home Companion (Garrison Keillor's popular National Public Radio show) and a memorable date alongside Rosanne Cash at the prestigious Celtic Connections festival in Glasgow. 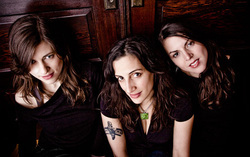 "One Voice," a live staple and highlight of the Jennys' Juno-winning debut album 40 Days, remains a metaphoric statement of intent that to this day underlines the group's original mandate: three individuals with unique gifts combining seamlessly into a single beatific entity. Soprano Ruth Moody (guitar, banjo, accordion, bodhran) and mezzo Nicky Mehta (guitar, harmonica, ukulele, percussion) are charter members who've anchored the Jennys since the first line-up formed in their Winnipeg hometown. The critical third voice, an alto who fills out the chordal range of the group's vibrant three-part harmonies, has been filled in turn by Cara Luft, Annabelle Chvostek and, now that the latter has returned to her own solo career, new recruit Heather Masse. Launching what fans are fondly calling version 3.0 of the Jennys, Heather is a Boston-based singer and pianist who finds the middle ground between contemporary bluegrass (through her work with roots supergroup The Wayfaring Strangers) and jazz vocals (which she studied at the New England Conservatory of Music). She gelled immediately with Ruth and Nicky during an impromptu audition in a bathroom backstage in Philadelphia. Singing raw versions of "Amazing Grace" and an old Hank Williams song, the three women quickly nailed the essence of the Jennys' exquisite sound while hinting at exciting new possibilities that will flower in the months of touring and studio sessions that lie ahead. "Heather fits in astonishly well with us," enthuses Nicky. "She's got a smoky, enveloping kind of style. People will go nuts when they hear her." Adds Ruth, who first learned of Heather from their mutual friend, Crooked Still's Aoife O'Donovan: "We found a perfect vocal blend the first time with Cara, then we captured it in a different way with Annabelle. So naturally we were thinking, 'Oh man, can it really happen again?' But we have stumbled on such a rich treasure. Her voice is just so round and warm." Ruth Moody has long understood the power of three. She grew up in an accomplished musical family singing with two sisters, then spent five years fronting Winnipeg's Scuj MacDuhk. When the popular Celtic/roots road warriors broke up in 2001, she again craved what she calls "the sense of completeness and wholeness that can only come with three female voices. The Jennys provide a sense of continuity that threads through my entire life." For her part, Nicky Mehta was on track for post-graduate studies in communications when she released a buzzworthy solo debut CD and, not long after, signed on as a first-generation Jenny. "The group sort of just happened to us," she says, laughing. "The idea was to present our individual visions in a larger collective, but before we knew it things had taken on a life of their own. We've constantly been playing catch up ever since. What's great is that nothing has been premeditated and we keep being surprised in the most creative, interesting ways." Surprise has been turning to awe with happy regularity of late. Singing "If A Tree Falls" with her childhood hero Bruce Cockburn at the 2006 Edmonton Folk Festival was pure delight for Nicky. And Ruth still can't quite believe she has had the chance to play alongside Nashville dobro genius Jerry Douglas and the inspirational Bonnie Raitt. "Now we've closed another chapter in the Jennys' story and opened a new one," says Ruth. "We're thrilled to be writing it with Heather. She's a kindred spirit. That we can find the magic while laughing and singing together in a dimly lit bathroom says it all really."